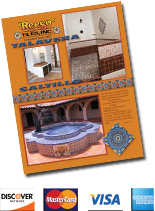 T-10 - Reeso Tiles, Inc.
Mexican handpainted blue decorative clay tile. This pattern makes a great collage of blue and white patterns. T-71 looks exceptionally well with this pattern.